6th Urban Expert says: THE FORWARD THINKING THING TO DO IS "SAVE THE VIADUCT" — Why Save the Viaduct? To Keep Kids Safe. 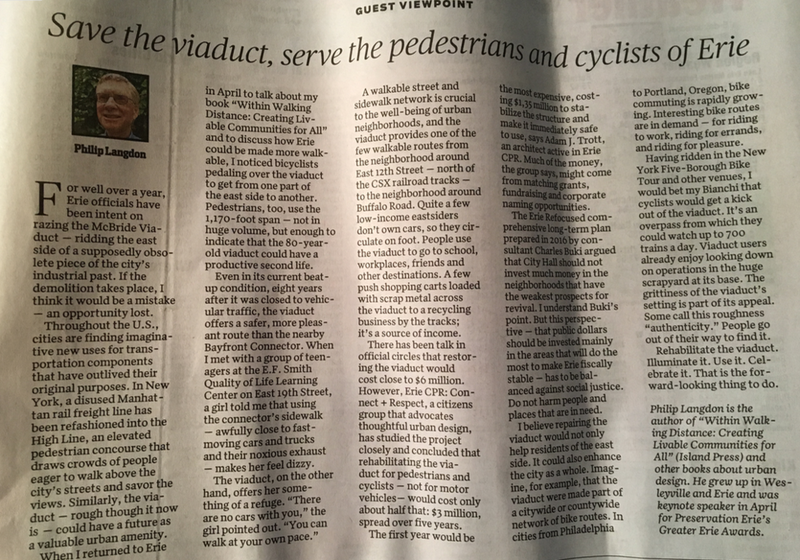 6th Urban Expert says: THE FORWARD THINKING THING TO DO IS "SAVE THE VIADUCT"
Erie Times-News GUEST VIEWPOINT in support of saving the Viaduct written by Philip Langdon, June 25, 2018. When I returned to Erie in April to talk about my book “Within Walking Distance: Creating Livable Communities for All” and to discuss how Erie could be made more walkable, I noticed bicyclists pedaling over the viaduct to get from one part of the east side to another. Pedestrians, too, use the 1,170-foot span — not in huge volume, but enough to indicate that the 80-year-old viaduct could have a productive second life. Philip Langdon is the author of “Within Walking Distance: Creating Livable Communities for All” (Island Press) and other books about urban design. He grew up in Wesleyville and Erie and was keynote speaker in April for Preservation Erie’s Greater Erie Awards.